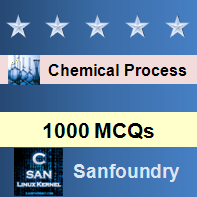 This set of Chemical Process Calculation Multiple Choice Questions & Answers (MCQs) focuses on “Mole and Molecular Weight-IV”. 1. How many moles of NaOH are there in the bucket? Explanation: Number of moles = mass / molecular weight. 2. How many moles of H2SO4 are there in the bucket? 3. How many moles of H2O are there in the bucket? 4. What are the number moles of Oxygen present there in the bucket? Explanation: Moles of Oxygen = Moles of NaOH + Moles of H2O + 4(Moles of H2SO4). 5. How many moles of Hydrogen are there in the bucket? Explanation: Moles of H = Moles of NaOH + 2(Moles of H2O) + 2(Moles of H2SO4). 6. What is the weight percentage of H2O? Explanation: Weight percentage = mass of the component / Total mass. 7. What is mole percentage of H2SO4? Explanation: Mole percentage = Moles of the component / Total moles. 8. What is the weight percentage of NaOH? 9. What is mole percentage of NaOH? 10. What is the weight percentage of H2SO4 ?